Anna Creek Station is the world's largest apparently. This is not taken after a bushfire. There is no bush to burn, no evidence of any living thing, just black gibber plains as far as the eye can see. It is simply awesome to stand in the midst of it and wonder how anything survives in temperatures that often reach the high forties and even fifties, let alone the fact that someone actually runs a business raising animals on it. 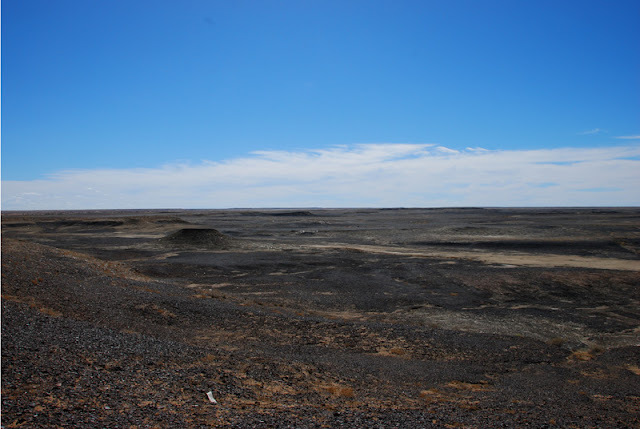 This spot is ten or twelve kilometres from Lake Eyre, at the point where ground level falls from about zero metres above sea level to roughly thirty below. Pete, re your comment on my blog. These landscapes are absolute rippers too. It's the country itself that is our teacher. I am so looking foward to one day seeing more of your pictures than this mere taste.